Gardening enthusiasts with a green thumb, and those who simply appreciate the beauty of tropical flowers, foliage and trees, are soaking up that beauty this week at the Summer Garden Plant Market Exhibition in Okinawa City. 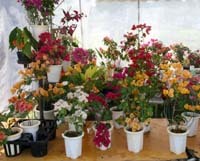 The event sponsored by the Okinawa City Petal Gardening Production Association and the Okinawa Times newspaper company runs through Sunday at the Okinawa City Agriculture Study Center, 2380 Noborikawa. The exhibition, which is open to the general public, features many flowers and tropical fruit trees, as well as bonsai trees, creation garden trees, gardening trees and foliage plants. Visitors have opportunities to quiz the horticulturalists on just how they make everything grow, and how to squeeze that extra bit of beauty out of plants and trees. Many of the plants and trees on exhibition are available for sale throughout the week. The exhibition caps Sunday afternoon with a charity auction beginning at 2 p.m. Information about the show is available at (080) 3977-6597.